Hi Everyone! 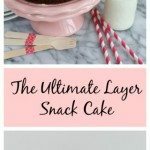 This is Aida from The Crafting Foodie, and I’m so excited to be back at The NY Melrose Family sharing this whimsical, easy, and delicious Ultimate Layer Snack Cake. So, I know the world “ultimate” is a little loaded. Okay. It’s really loaded. But this Ultimate Layer Snack Cake is made up of three of my all-time-favorite sweet treats: chocolate chip cookies, Rice Krispie treats, and brownies. Making it the ultimate treat. When my kids have play dates, I like making an after school snack. I’ll ask my girls what they’d like to have, and it’s often a discussion debate argument between chocolate chip cookies, brownies, and Rice Krispie treats. But, then I realized, why do we have to choose just one? 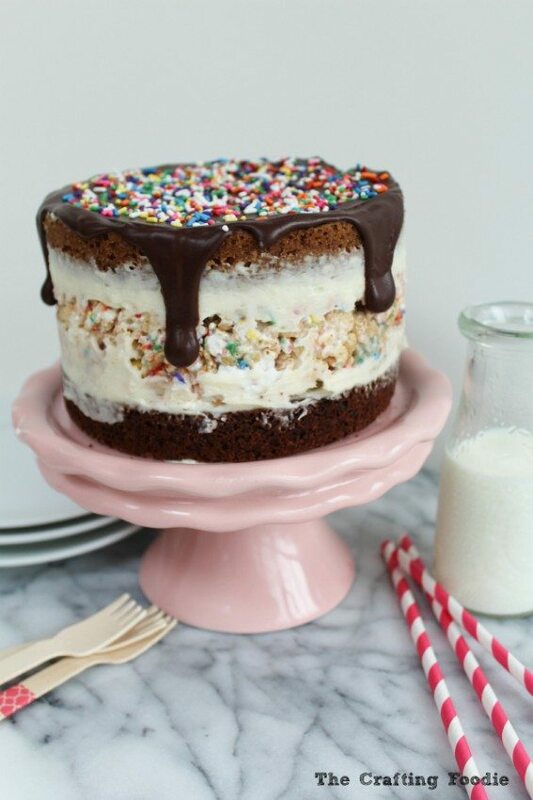 Why not put all three treats into one Ultimate Layer Snack Cake? You’ll notice that the Rice Krispie treat layer is a little thicker than the rest. That is simply because Rice Krispies treats are pretty darn popular in my house. I make a pan of them, and they’re usually gone in an afternoon. That’s saying a lot for the picky eaters in my house. And of course we added a few tablespoons of sprinkles to the Rice Krispie treats because sprinkles absolutely belong on a cake that’s dubbed the Ultimate Layer Snack Cake. How can any cake be ultimate without sprinkles? The brownie and the chocolate chip cookie layers are good ol’ fashioned recipes. Nothing unusual or unique about them, except the fact that they’re made in such a small amount. And honestly, it took me three tries to get the brownie and chocolate chip cookie recipes just right. Reducing the size of a recipe is way more difficult than it seems – especially when eggs are involved! But all the experiments and trials were well worth it because this cake will not disappoint. I promise. One of the best parts about this Ultimate Layer Snack Cake is that it’s perfect for sharing. You can cut a slice and each person can take which ever layer they’d like, or you can do what my kids did – eat the entire slice yourself! Each layer of this Ultimate Layer Snack Cake features a classic treat: chocolate chip cookies, Rice Krispie treats, and brownies. 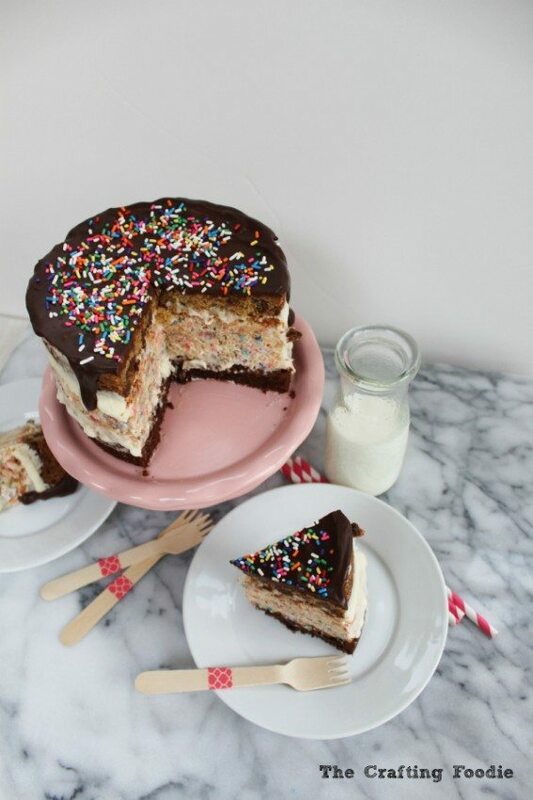 The entire cake is topped off with a rich chocolate ganache and heap of rainbow sprinkles. Line the bottom of a 6-inch round cake pan with parchment paper and grease. In a small bowl, mix the flour, baking soda, and salt. In a medium bowl, using a wooden spoon, mix the butter and brown sugar until fluffy. Add the egg yolk and vanilla. Mix until combined. Mix in the chocolate chips. Spread the batter in the cake pan. Smooth until even. Allow the cookie to cool in the pan for about 15 min. Then remove the cookie from the pan, and allow it to cool completely on a cooling rack. Prepare the 6-inch pan in the same manner as you did for the cookie layer. In a small bowl, mix the flour, cocoa, salt, and baking powder. In a medium bowl, mix the butter, sugar, egg, and vanilla. Add the dry ingredients to the egg mixture. Mix in the chocolate chips. Pour into the prepared pan and smooth the top. Bake for 15 minutes. Allow the brownie to cool in the pan for about 15 min. Turn the brownie out of the pan and allow it to cool completely on a cooling rack. Prepare a 6-inch circle pan as described above. In a large pan, melt the butter and marshmallows over medium heat. Once the marshmallows are completely melted, remove the pan from the heat. Add the cereal and mix. Once the mixture has cooled a bit, but is still pliable, add the rainbow sprinkles. Mix until combined. Pour into the prepared pan. Allow the mixture to cool in the pan completely - about 1/2 an hour. Remove the cereal treat from the pan. To make the frosting, in the bowl of a mixer fitted with a paddle attachment, beat the butter and confectioners' sugar until light and fluffy. Add the salt, vanilla, and cream. Mix until light and fluffy. To assemble the cake, place the brownie layer on a cake stand. Spread about 1/4 cup of frosting over the top. Add the Rice Krispie treat layer on top of the brownie layer and spread another 1/4 cup frosting. Add the chocolate chip cookie layer. Set the cake aside while making the chocolate ganache. Place the chopped chocolate in a medium bowl. Heat the cream until its just about to boil. Pour the hot cream over the chopped chocolate. Allow it to sit for a minute or two. Then mix until smooth and shiny. 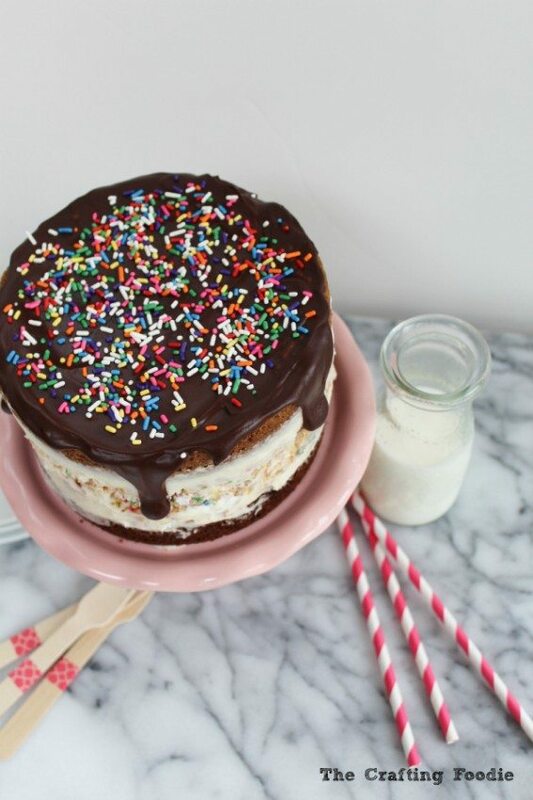 Pour the chocolate ganache over the cake and sprinkle with rainbow jimmies. This is really an ultimate cake! Chocolate chip cookies, rice krispie treats and brownies! 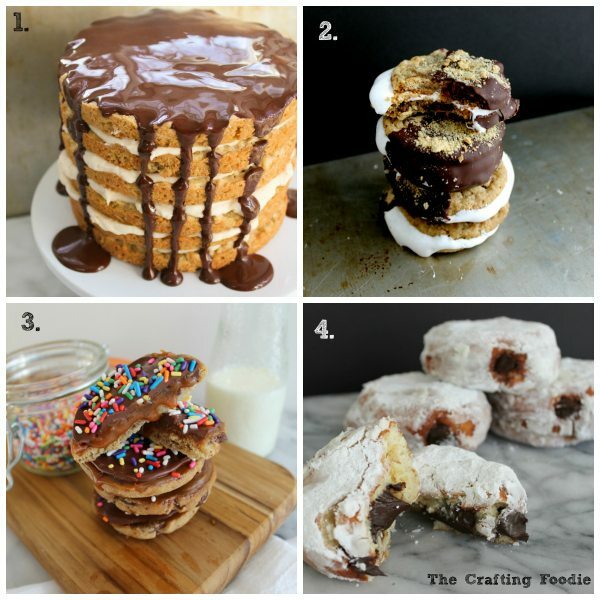 All these 3 in one cake. This is wonderful! This is really an ultimate snack treat to everyone!